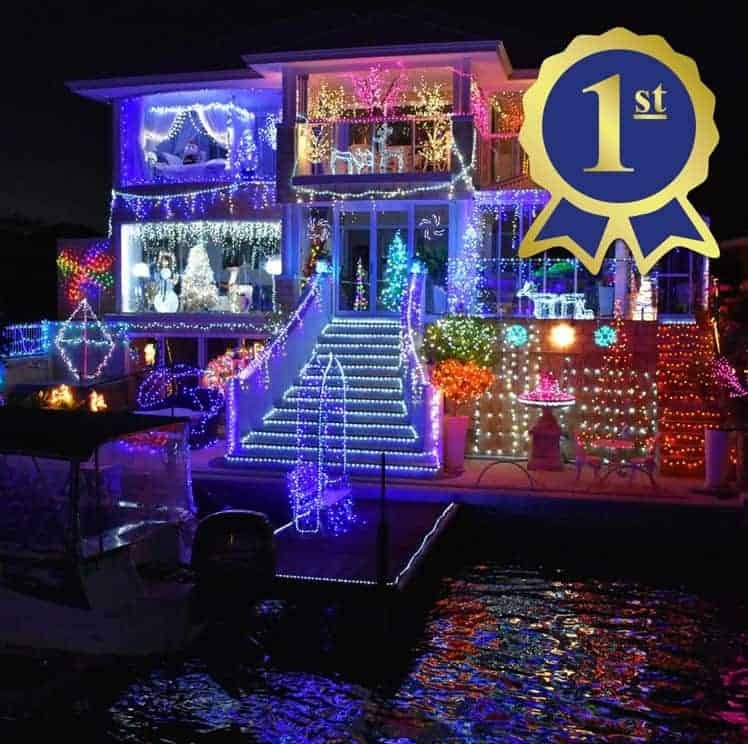 For the 2018 / 2019 Christmas Lights Cruise season we again hosted a photo competition to help choose the best Christmas Lights decorated canal home in Mandurah – The People’s Choice Award! Passengers on-board our Christmas Lights Cruises were asked to take a photo of their favourite Christmas Lights house, upload it to our ‘photo competition’ tab on Facebook. The house with the most entries would be declared the winner of The People’s Choice Award and all who submitted a photo entry went into the draw to WIN a Mandurah Weekend Escape and other great prize packs. The Christmas Lights Photo Competition entries have been counted and were announced at the Thank You and Awards night, put on for the Port Mandurah canal residents by Mandurah Cruises, on Sunday 3rd February. Here are The People’s Choice for the best decorated Christmas lights house 2018 / 2019! Congratulations to the winning house known as ‘The Doll House’ by our crew (38 Aztec Island Rt). The People’s Choice Award place getters were presented with trophies, cheques and prize packs at the Thank You and Awards Dinner hosted by Mandurah Cruises. Other award categories include The Judges Awards (Top 20), Best Canals , Hall of Fame, Spirit of Christmas and Rookie Awards. Photo competition winners will be contacted by email. A huge thank you to the Port Mandurah Canal residents for putting on such incredible displays again this season and to everyone who entered our Christmas Lights Photo Competition to determine the winner of this award. Tickets are on sale now for next season’s Christmas Lights Cruises! Phone 9581 1242 or visit our Christmas Lights Cruises page to reserve your seats now! Next Next post: Wishing Well Record!